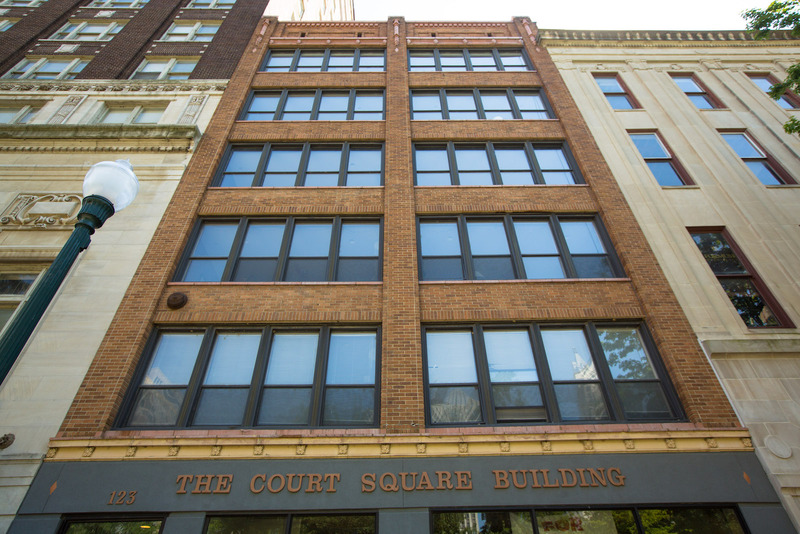 The Lofts at Court Square are housed in a quaint 1913 building tucked into a row of brick structures that line the south side of Court Square in the Downtown core. The building features six unique units, each with its own charm and amenities. Units offer views of historic Court Square from balconies or private patios. The six condos range in size from 1,100 square feet up to nearly 1,600 square feet. A compelling feature of The Lofts at Court Square is its location. Though the building provides all the amenities of urban living, Court Square substitutes for the “backyard” that comes with larger homes elsewhere in the city. The fountain, gazebo, shade trees and lush grass come together to form a quiet oasis in the heart of the city, adjacent to the Main Street trolley line. Court Square was one of four original municipal parks laid out by city planners in 1819 and is the only one that remains in its original form. Today, it’s where Downtown residents walk their dogs, friends chat quietly on park benches and food trucks park to sell some of the tastiest food in the city. On summer evenings, you might find a band playing under the gazebo.